We will be using Dash rather than EZ Facility for all programs that start on December 1 and later. Those leagues will be running through our new website, www.SoccerZoneTexas.com. All SoccerZone players and parents should download the Dash platform app from the App Store. The new app will allow players to RSVP for games, make payments, and see schedules all in one place. Your child will have a blast and develop their athletic skills by playing soccer, volleyball, ultimate frisbee, flag football, dodgeball, kickball, capture the flag, and more! Cost is only $109 for 3 half-days (8:30-12:30 or 12:30-4:30) or $169 for 3 full-days (8:30-4:30) Nov 19-21. Each child receives kid-friendly coaching and instruction as well as a t-shirt and [for full-day campers] an amazing lunch every day. Sibling discounts available. Ages 5-13. 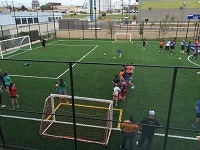 San Antonio's leading soccer development program, teaching soccer skills in a fun, interactive environment. Indoor 6v6 Raising Cane's Field starts at $150/hour. Indoor 4v4 Soccer Factory Field starts at $75/hour. Outdoor 7v7 Field starts at $100/hour or $50/hour for half. Beach Volleyball Courts start at $40/hour each. Take your child to the next level! La Academia training prepares your child (5-14 years) to be the best player he/she can be. Participate in our youth indoor league. We provide a coach, team shirt, 8 games and weekly practice. Includes Drink Tower, plates, napkins, utensils, two hours of fun, and lasting memories! All ages welcome. $50 Deposit; 12 kid minimum. Costs $720/team ($150 deposit to save your spot) or $79/player for an 8-game season (ref fees included). We offer leagues for every age and skill level (Men's, Women's and Coed). You pick the league and you can expect all your games to be on the same night each week. Costs $5 members, $8 non-members. Play 6:00-11:00pm on our well-lit 7v7 outdoor field! Indoor, daytime availability as well; please call ahead. Age 7 through high school. 8 games for $800 (includes ref fees). Individual players are encouraged to register for our La Academia program that includes a trained coach, team shirt, and weekly practice. Ages 4 through high school. Fall and Spring leagues for the older kids; year-round for the younger kids. Individual players are encouraged to register for our La Academia program that includes a trained coach, team shirt, and weekly practice.